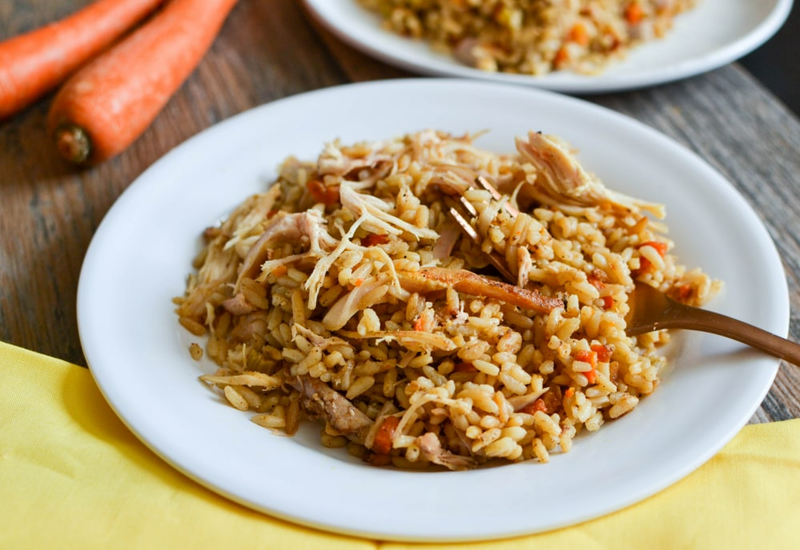 Juicy chicken thighs and legs pressure-cooked with rice and vegetables and seasoned to perfection make a perfect and complete weeknight meal the entire family will enjoy! The dark meat chicken is more flavorful and less likely to dry out during the cooking process. For many, these are the most delicious cuts! Along with this hearty protein, the recipe also includes a serving of vegetables as well as rice. When everything is done in one pot, cleanup is a breeze and you can enjoy more time at the dinner table with your family. This recipe calls for white pepper rather than the black pepper that is used more frequently in dishes. They come from the same fruit, but with white pepper, the dark outer skin is removed by soaking before the seed is dried. The result is that white pepper is a bit spicier and fruitier than black pepper. It has an earthy flavor that is slightly smoky. Per Serving: 296 calories; 12g fat; 18.9g carbohydrates; 28g protein; 133mg cholesterol; 827mg sodium. Very good chicken and rice recipe! I could smell the aroma before it finished cooking, so delicious. The rice was very flavorful and the perfect texture. I will definitely make this again. This recipe reminds me of the chicken and rice my mom made for us as kids. So good! I love how tender the chicken is, it literally falls off the bone. I used boneless thighs, and I'm sure it's equally as good with chicken breasts. This is definitely my new go-to chicken and rice recipe. This is now my go to chicken and rice recipe! Such a quick and easy weeknight meal that my wife and kids love! The seasonings have a Cajun-like flavor but it's not spicy. I shredded the chicken and mixed it in with the rice. Perfection! Comfort food at its best! Great balance of spices in the rice and on the chicken. Love cooking the rice with the chicken, too. Never underrate a recipe that allows you such an easy post-dinner cleanup. Will get heavy use on nights we have baseball practice! Oh, you probably could use either all thighs or breasts, but I found that the mixture gave a nice level of fattiness/moisture to the dish. Tinker as you will! My family really liked this. I used boneless, skinless chicken thighs. I didn't have shallots so I used onions and substituted 1/4 cup wine and 1 cup water for the chicken stock. Turned out perfectly. Absolutely delicious! My hubby and I loved it! Just enough spice without it overwhelming the dish. Chicken was so tender and rice was perfectly cooked. Wish I could give the recipe 10 stars! Just made this and used thighs and breast tenderloins. I didn’t have shallots but did have garlic and everything came out great. Delicious and will definitely make it again! Very tasty dish! My family loved it! I made it using all chicken thighs and no shallots because it was all I had. Aaaaamazing!!! Def will be a recipe I will make often. I used a whole chicken that was pre cut up about 5.5lbs worth. I followed all other ingredients and directions and it was perfect. I used jasmine rice and it came out so flavorful. So delicious! The chicken was perfect and juicy. The rice and veggies were perfectly seasoned! This recipe came out really good .. my boyfriend and I were very pleased w/ the results. It was quick and easy .. will be our go to for a quick weeknight meal .. I will make a side salad to go w/ it next time.